One of the lessons from the November U.S. election and the June Brexit vote is that our ability to predict future events is fraught with error, even if the underlying data is relatively sound. National polls were roughly in line with the final U.S. popular vote (with geographical differences) yet a lot of the analysis around the election surrounded the certainty and near impossibility of a Democratic defeat. This bias towards certainty appears in many facets of life, and can cause serious missteps in behavior. Probability distributions describe a range of potential outcomes. When learning elementary statistics, the underlying data is often assumed to be normal (black line at left). This is done not for indoctrination but because it is the easiest distribution to study to grasp a basic understanding of statistics. This is all fine in academia but when the distributions are applied liberally or without thought, many missteps can occur. 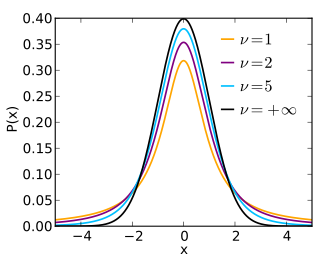 A t-distribution (explained at left with the other lines) is an attempt to explain a normal distribution with smaller sample size. A Poisson distribution describes the likelihood of an event in a certain time period and is not symmetrical. The lesson here is not to learn more about probability distributions (every time I use the word distribution, we lose 50 RSS readers), but to understand the uncertainties that lie all around us. Making a claim about the consequences of a political event, business process or financial decision should be layered in nuanced claims about uncertainty and the assumptions being made. Try to find these admissions in arguments. You won’t find them. Nowhere is this more true than in economics. One of the major reasons economics is a social science is that the underlying laws and predictability (j/k) of particle physics don’t perfectly apply to a dynamic system. Homo Economicus is a term used to describe a certain type of human: that which is perfectly rational, perfectly integrating new prices and information into an optimizer function and acting according to her best interest. This abstraction grossly oversimplifies human actors, who can act for a myriad of reasons often not understood by even themselves. This is often used as evidence itself of the inefficiency of markets, but uncertainty can explain why markets can be efficient, in the sense that they are not predictably incorrect. Irrationality is often studied in the context of predictable bubbles, investor psychology or poor individual decisions. The certainty required on a market as a whole to determine behavior as irrational in advance is difficult to overcome. Individual actors in an economy have a lot of uncertainty underlying their decisions too (Will this investment go bust? Will I want beef this week?) that may be difficult to tease out on a larger scale. The easiest way to determine the confidence of a statement is to apply a bet. Where financial pain and gain can come from the outcome of the falsifiable claim. Unfortunately, this is very difficult to implement on a large scale, with many voices on social media, in your personal life and in your professional life. If you believe the Seahawks will win the Super Bowl this year, I will pay you $4 for every $1 you pay me if they don’t. This is a statemeny both acknowledging that I don’t think the Seahawks will win the Super Bowl and that I think it is quite possible. There are many future outcomes possible and applying bets to decisions most concisely reveals certainty. Financial products, ranging from credit default swaps, collateralized debt obligations and mortgage-backed securities to stocks, bonds and options allow perhaps the purest form of this bet. Your job as an investor is not to convince other people you are correct. It is simply to maximize your return given a certain amount of risk. If you are right, you get to redeem the bet in financial payout just as you would have to pay yourself for being incorrect. Risk is the uncertainty in an investment or decision. If a stock can be perfectly predicted, both up and down, there would be no risk involved. Just be sure when listening to a claim or an argument being made (even at DQYDJ!) to understand the amount of uncertainty that must exist in any large claim. Humans are biased towards confidence, where the exact opposite is warranted.